Hitting the road tomorrow until Christmas. Will try to post a couple of updates but in the mean time want to wish everyone a safe & Merry Christmas, and of course a Happy New Year too! Amazing Christmas display with 176 channels and 45,000 lights! The show is so popular that it requires a crew of 3 people to manage the traffic. Understanding our money and our economy is difficult, no doubt. There are a lot of pieces to the puzzle, but no piece is as perplexing and as troubling as backing our money with debt. I explain this everyday here at Economic Edge, it is at the root of our current and future problems. The “WHO” behind our money have used their self-generating debt money to influence politics to an unprecedented degree, thus the other main trunk of the problems’ root. For quite some time I have seen the debt saturation and I could see where it is leading. Those places are dark places no one wants to visit. 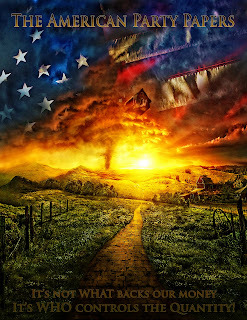 Without altering our current path I see much pain and historic events to follow. What I could not see until I really examined Bill’s line, was a way to get past the debt to a sustainable and prosperous system that works for the people going forward without crashing the world’s economy in the process! No easy feat, for sure! Most who understand the extent of the debt and how the math no longer works will likely say that it cannot be done. It can be. The way to do it can be found in the outlines below. The key is repairing the root causes of the problem. The symptoms will then take care of themselves. Still, it is no easy undertaking moving from a highly leveraged, debt saturated, and derivative entangled world to a prosperous future. That means that as you read these outlines you’ll have to think the parts through one at a time. Then ask yourself what each part means, what it does, and how it works in concert with the other elements of the proposal. Over the past several weeks I have spent countless hours developing, tinkering, constructing, twisting, and sharing my thoughts with Bill Still and others to come up with these outlines. My full outline is now roughly 40 pages long - so much that I know the average person won’t even think about getting through it. So, I boiled all that down to its essence and developed what I call the “minimal” version below. It gives a very quick overview primarily of the monetary reform portion of the proposal. Hopefully it will motivate and inspire you, but I know it will leave you with many questions. That’s why I created the “medium” length version you’ll find below that. It will fill in the detail. I hope you will take the time to MAKE IT ALL THE WAY TO THE END. It will take some time, but I think you will find it worth it. *To PRINT, click "download" then "open" to open in your .pdf viewer where you can either save or print. Printing directly from the Sbribd menu may not produce good results. 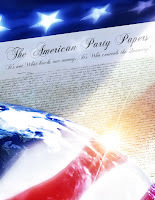 These are called the American Party Papers or Freedom’s Vision. The hope is that they explain the basis for change in the same way that the Federalist Papers did when Hamilton and Madison were exchanging ideas about the Constitution. Thus, we await and welcome your ideas, and even your criticisms. In fact, we thrive on it! Each hole you find, each recommendation, works to make it that much more bullet proof. And no, we don’t have all the answers and we’ve left enough room for other experts to weigh in, to take ownership of a piece of the program. I have some audio coming in the next few days to help further explain the thinking and to add additional background. Please check back for those, I’ll post links in the Freedom’s Vision spot in the upper right hand corner of this site. By the way, there’s a new web site on the way dedicated to the implementation of these proposals. It will also play the part of SWARM central! EVERYONE is a part of the solution! We all have a role to fill in creating a stable and prosperous future, even if that role is simply participating in the "SWARMS" that are coming. If you recognize the need for change and see these proposals as a way forward, I would ask that you please take it to the next step. No one is going to do it for you, it is you, it is me. WE must all take ACTION. The action you can take is to volunteer your time to help organize others, to go out onto the web and link these proposals for others to see. To directly ask other bloggers, organizations, and media to support these proposals and to spread the word. We need them to go viral, we need to organize, and we need to get the swarms focused on their targets, one state, and one politician at a time. 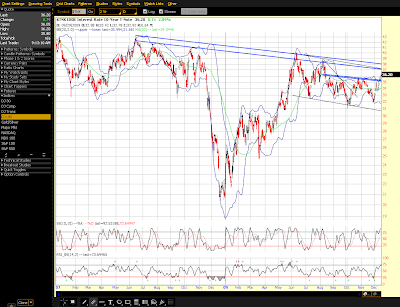 While the NDX is up, the RUT is barely up, having already broken below its little pattern on the 5 minute chart. The dollar is higher once again, pushing the Yen and Euro lower. Amazingly, even against the strong dollar oil is up a little – games galore being played here. Gold is about flat after a huge move down yesterday and it now resides at about $1,100. If you remember, when gold broke its rising formation I said that I thought the first area of support is about $1,070, and we’re almost there. Of course that’s just the first area, it certainly could bounce there and then proceed even lower… the next area of heavy support will be at about the $1,000 mark. No economic data today, however I note that M2 was reported yesterday as having fallen by $12.8 billion in the prior week, and that the Fed’s balance sheet expanded by $22.8 billion – gee, taking in more garbage from banks who are supposedly paying back the TARP? The funniest article of the morning has to be about the losses that Harvard University is incurring. Turns out that while Larry Summers was there he was buying interest rate swaps (derivatives) betting that interest rates would rise. How did that turn out? The swaps, which assumed that interest rates would rise, proved so toxic that the 373-year-old institution agreed to pay banks a total of almost $1 billion to terminate them. Most of the wrong-way bets were made in 2004, when Lawrence Summers, now President Barack Obama’s economic adviser, led the university. Cranes were recently removed from the construction site of a $1 billion science center that was to be the expansion’s centerpiece, a reminder of Summers’s ambition. The school suspended work on the building last week. That’s right, they had to pay $1 Billion just to terminate them! And this is the guy running our economy, Obama’s right hand man. That experience is a classic example of the risks that derivatives pose. Construction occurring that shouldn’t have been, the geniuses believing that their risk was offset, they simply failed to perform their due diligence. Of course the irony is that not only is Summers running our economy, but that Harvard continues to be the source of education for the supposed top economists in the world. If you purchased the iShares Barclays 20+ Year Treasury Bond Fund (TLT), an exchange traded fund (ETF) that owns long-term Treasuries, at the end of 2008, you would have already lost more than 20.5 percent! That INCLUDES interest payments, by the way. As a matter of fact, 2009 has been the absolute WORST year for total return on long-term Treasuries since at least 1973. That includes dismal years such as 1994 and 1999, which occurred during Fed rate-hiking cycles. And in yet another sign of how poor the economy is, Pepsi, after 23 straight years is taking a pass on advertising during the Super Bowl this year. Like I said yesterday, the money involved in professional athletics is squarely in bubble territory, a bubble that is just beginning to unwind. 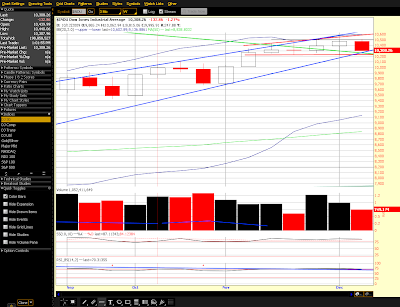 Yesterday was close to being a 90% down volume day, it did do some technical damage in a few areas like the XLF. Below is a WEEKLY chart of the DOW, just to show what has happened following the weekly hammer that was produced last week. That is now a confirmed reversal indication on the weekly chart, occurring at the same time that the weekly MACD is rolling over to produce a sell signal. If we close today at or below the channel bottom, it will be a very bearish pattern, but again, that area will also offer support, so being impatient is just not prudent. 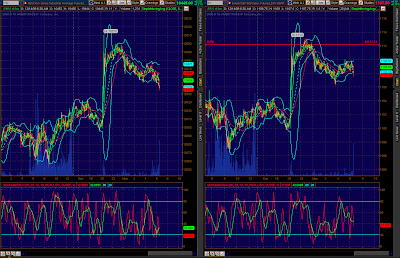 I would expect that the weekly volume will be higher once today's options expiration volume is added. And so we end this velvet smooth week focusing back on Freedom’s Vision. Although not perfect yet, I am going to begin posting my outlines today. Make no mistake, this is a battle for freedom, a battle for the future of America. Thus the final tune of the week portrays a battle over saving Liberty, the good guys against the bad. Gee, which side of that battle would Larry Summers be on? You know, I have this annoying habit and can't help myself. I love statistics, numbers, charts and things of such nature. Even though I announced my self-imposed exodus from blogging a few weeks ago, somehow I can't drag myself away on a permanent basis. So, with that in mind, I took a few hours out of my day and compiled unemployment claims data going back to late 2007. I then created a couple of charts which Nate has helped me to share with you here on the Economic Edge. 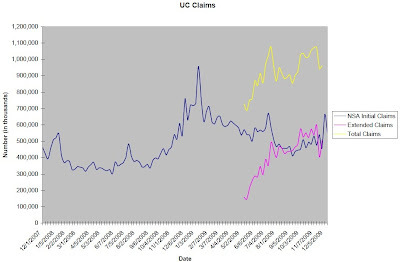 First, there's a chart depicting total continuing UC claims on a weekly basis. 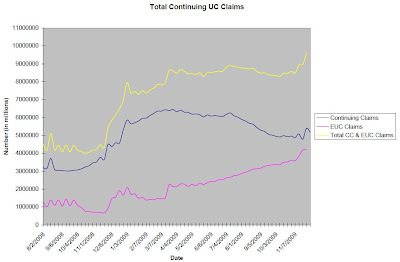 Second, there's a chart for total UC claims on a weekly basis. These numbers are NOT seasonally adjusted; they are the raw data released by the Department of Labor in its weekly initial claims report. What you see is a slow but steady climb in continuing EUC (Emergency Unemployment Compensation) claims beginning in March 2009, and a dramatic spike in extended UC benefit filings beginning this past summer. Note that the amount of extended claims filings recently surpassed initial claims filings during some weeks. Soon, I expect EUC continuing claims to do the same in reference to regular continuing claims. Clearly you are NOT seeing an improvement in employment. Rather, the opposite is occurring and it's getting much, MUCH worse. If you want to know what I think the near future holds, take a look at last January's filings. That ought to give you a hint. EUC claims, in my opinion, are the DOL's "off-balance sheet", akin to SIVs, financial institution off-balance sheets. It's a perverted game of "job market hide-and-seek." In a nutshell what Point’s charts are showing is that the total combined regular AND Emergency claims is still growing, and that’s despite thousands of people falling completely off the backside of the rolls. 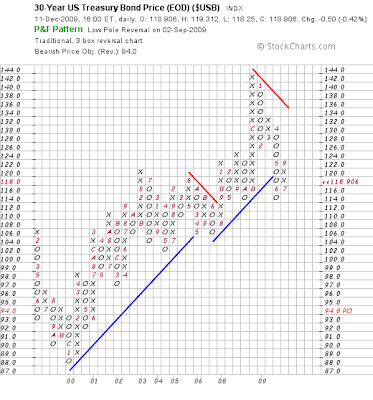 Thanks for the charts and analysis, Point. It’s too bad that the mainstream media can’t do a little digging to put two and two together. It’s also too bad that our own government doesn’t admit the problems we face… of course that would mean admitting that their debt to solve a debt problem ways aren’t working. Hey, nothing but blue skies! A lengthy but worth it read from Paul this month. In this issue he is right-on in discussing the risk filled events that are happening in Europe and the Middle East. He also discusses his theory on inflation, and again he’s one of the people who sees both inflation and deflation occurring together. I have to comment on that as what he and others see is capital flowing from one asset group to another, not inflation or deflation. By definition only ONE can possibly happen at once. The definition being that inflation is an increase in the total supply of money and credit (I add in the leverage of credit via derivatives), deflation being the opposite. Again, only one is possible at a time. Now, within that context, it is possible for asset classes to bubble up at the expense of others. I am sticking to the fact that overall DEFLATION is occurring… the asset classes that are losing and overpowering all the other bubbles are three fold: 1. Derivatives within the shadow banking world; 2. The supply of Credit; 3. Real Estate. The bubbles that everyone sees elsewhere are simply overwhelmed and will continue to be overwhelmed until either one of two things happens: 1. 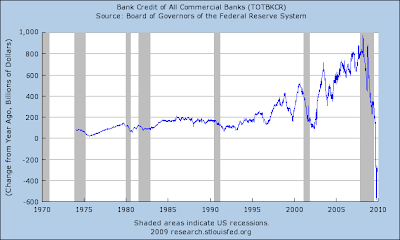 The Fed unhinges money printing from DEBT; or 2. The stimulus and other programs are pulled. Pulling support will immediately lead back to another deflationary episode – this is the best case scenario if the goal is to extend the life of our current debt backed money system. 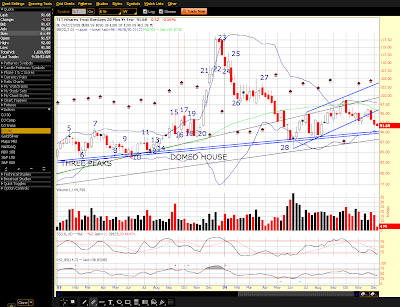 Option 1 results in a loss of confidence in our currency making the gold bugs correct in the long run. When debt goes out of control, deflationary episodes result and are nature’s way of trying to force the debt out of the system. When the quantity of money gets out of control, then confidence is lost and the money system is destroyed. Since our money is backed by debt, until they disconnect that backing, another round of deflation is likely. It may be that the next bout of strong deflation forces them to unhinge money production from debt. Either way the math does not work and the destination is the same – the demise of our current monetary system and with it come the “other events” unless we do something about it first. This is why it is necessary to "do something" about it now - that is exactly what I'm proposing. Paul also gives Martin Armstrong a lot of credit in this report and sums up his thinking from his point of view. Of course all of Martin’s papers can be found right here in the right hand margin. Thanks for sharing all your thoughts and hard work, Paul, appreciate it! The dollar is on an absolute tear, now already back up to 77.85, strength is mostly against a weak Euro. This is exactly the type of bounce that occurs when everyone is convinced that the dollar has no future whatsoever. And it doesn’t, at least not in the longer run, but crowded trades can quickly turn into a rush for the exits. Bonds also rose sharply overnight, going to show that there are still decisions to be made. 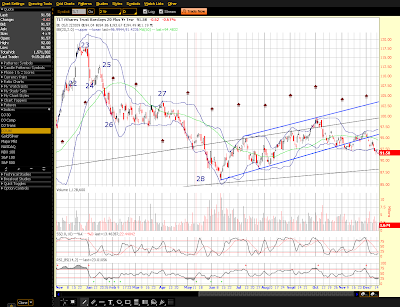 They can keep interest rates low if they desire, at least for awhile, by letting the speculation in equities drain. Amazingly oil is holding up fairly well against the force of the dollar, I think oil has turned into an economic weapon and is involved in the dealings of Dubai, Citigroup, Abu Dhabi. Just yesterday this article came out discussing the possibility of a new Middle East currency; The Arab states of the Gulf region have agreed to launch a single currency modelled on the euro, hoping to blaze a trail towards a pan-Arab monetary union swelling to the ancient borders of the Ummayad Caliphate. Gold has moved down significantly, giving up the past two days worth of bounce. Initial jobless claims rose slightly in the Dec. 12 week to 480,000 vs. expectations for 465,000, a mild disappointment that doesn't derail the trend which points to a bottoming for the labor market. The four-week average, especially important to watch during the calendar and seasonal effects of the holidays, points to improvement with a 16th straight decline, down 5,250 to the lowest level since September last year at 467,500. For the last several months, initial claims have been making their way down from the mid-500,000 level. Continuing claims have at the same time been making their way down from the low 6 million level, at 5.186 million in the Dec. 5 week and taking the four-week average down more than 100,000 to 5.318 million. The unemployment rate for insured workers is unchanged at 3.9 percent, well off the summer peak of 5.2 percent. Though contraction in continuing claims reflects in part the expiration of benefits, much of it also reflects new hiring. Today's report, despite the higher-than-expected headline, points to ongoing improvement in the labor market including strength for December's employment report. Markets showed little reaction to the report. Baloney, what new hiring? I have read several reports that because of slow holiday sales that many stores have been laying off their seasonal temps early. You want to talk about unemployment and a Depression? Detroit now has nearly 50% unemployed - Nearly half of Detroit's workers are unemployed. And in the world of no morals and ethics and bizzaro picks for Nobel Peace Prizes and Time Man of the Year, we learn that the AP has voted Tiger Woods Athlete of the Decade! Yet none of the media sources seem to be putting that one on their front pages? Heck, what he did as disgusting as it is, isn’t even in the same league as the damage to people’s lives that Bernanke has inflicted. Yet again, though, it would seem that as long as you’re dominate in your sport, and on that basis Tiger deserves athlete of the decade, that having shown a lack of moral standards doesn’t keep one from still winning awards. Frankly I’m surprised that his sponsors are actually dropping him. His behavior is too bad, he was definitely in the running to surpass Jack Nickolas as the greatest golfer who ever lived, but now I’m afraid that no matter what he does on the course his legend will never rise above Jack’s. We’re still in the range, but back towards the middle of it. 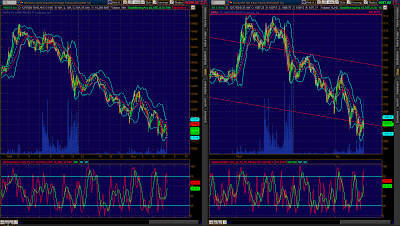 1,090 is the support pivot here, a break below 1,080 and a close there would be very bearish. Keep in mind that tomorrow is options expiration and we have Leading Indicators and Philly Fed coming out at 10 Eastern. While we’re in this range, I’m practicing patience, and no, I’m not playing Christmas Music yet! Other than that, I really have no strong reaction one way or the other, lol. But, I will also note that maybe, just maybe, this tremendously bad act of karma will come back to haunt them. I think I hear the hive getting ready to swarm, but I wouldn’t want to waste it on such trivia. The dollar is down slightly, bonds are up slightly, oil and gold are up as well. Abu Dhabi is now suing Citigroup in an attempt to get out from behind their prior deal to buy future quantities of Citi stock. Gee, it would seem that they would rather keep their cash? Can’t imagine why they don’t want to put their capital to work under the current conditions, can you? 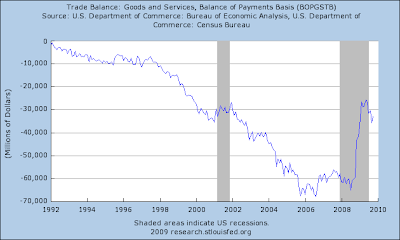 As far as today’s economic data, the worthless MBA Purchase Applications Index supposedly (who knows?) fell .1% versus the prior week’s gain of 4%. Whatever, show us some raw data or stop manipulating us altogether, will ya? 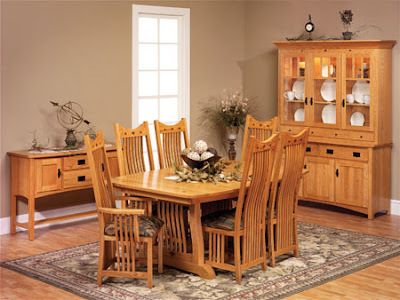 The consumer price report for November was calming on most financial markets despite the rise in the headline number. Both the headline and core numbers were much less inflationary than yesterday's scary PPI numbers. Headline consumer price inflation jumped 0.4 percent in November after gaining 0.3 percent the month before. The November headline matched the consensus forecast. Core CPI inflation-in contrast with yesterday's core PPI run up-eased to 0.0 percent (no change) after a 0.2 percent increase in October. The consensus had called for a 0.1 percent rise. The headline number was boosted mainly by a 4.1 percent surge in energy costs after a 1.5 percent gain in October. Gasoline was up 6.4 percent, following a 1.6 percent gain the month before. Food price inflation was soft in November with a 0.1 percent rise-the same as in October. Within the core, declines in shelter indexes offset increases in costs for new and used motor vehicles, medical care, airline fares, and tobacco. Shelter costs declined 0.2 percent in the latest month, led by a 1.5 percent drop in lodging away from home. Owners' equivalent rent dipped 0.1 percent. Hotels-including resorts-continued to engage in heavy discounting. High unemployment is keeping rent soft in general. Year-on-year, headline inflation increased to plus 1.9 percent (seasonally adjusted) from minus 0.2 percent in October. The core rate was unchanged in November at up 1.7 percent. On an unadjusted year-ago basis, the headline number was up 1.8 percent in November while the core was up 1.7 percent. Inflation is still high at the headline level but it is not as severe as earlier indicated by the PPI for November. A flat reading for the CPI core suggests that a sluggish economy is keeping underlying inflation tame for now. Remember that the PPI is where you’re going to see inflation FIRST, what happens there will be seen later in the CPI. Of course the largest underlying contributor is the cost of energy, so keep an eye on oil. Housing starts looked good for November but most of the gain was largely a comeback and then some in multifamily starts-a volatile component. The single-family component posted only a partial rebound. Construction companies picked up the pace of groundbreaking for new homes as housing starts in November rebounded 8.9 percent, following a revised 10.1 percent plummet in October. The November pace of 0.574 million units annualized came in right at the market forecast for 0.575 million units and was down 12.4 percent on a year-ago basis. The latest comeback was led by a 67.3 percent rebound in multifamily starts, following a sharp 29.5 percent plunge in October. Meanwhile the single-family component edged up 2.1 percent after a 7.1 percent fall the month before. Today's housing starts report is good but should be seen in the context of October's weak numbers. The two months together indicate that housing is in a slow recovery. The bad news is that the recovery is slow. But the good news is that the housing construction recovery is slow-anything more robust at this point would not be sustainable. The current account deficit widened in the third quarter, duh. The nation's current account deficit, hit by a deeper trade deficit, widened to $108.0 billion in the third quarter vs. a second-quarter deficit of $98.0 billion (revised from $98.8 billion). The third-quarter gap is 3.0 percent of GDP, the highest rate since 4.3 percent in the fourth quarter last year and vs. 2.8 percent in the second quarter. Those numbers are a VAST understatement of reality. The petroleum report comes out at 10:30 eastern, and the always exciting market action will follow the FOMC announcement at 2:15. No, you won’t see me playing in their reindeer casino games. Have fun. My guess would be that they will try to get up battering speed to try to break down 1,120. I doubt it, but you never know – and I think there is downside risk if they give inflation its proper caution. 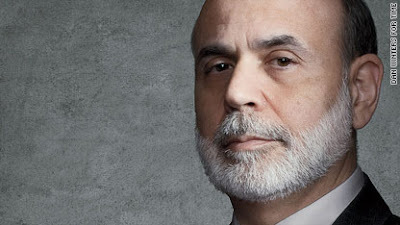 If they don’t, then everyone will be screaming inflation – but Bernanke, remember, is hell bent on not allowing deflation. Just remember what the bond market and the dollar are doing. Ben is not really in control, it’s only the big special intersts who want you to believe that. 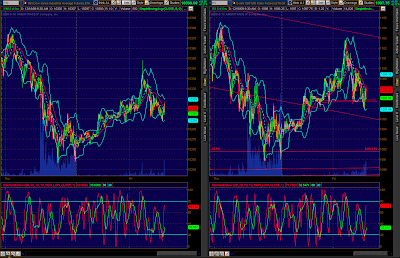 The technicals are the same since we’re still in the same trading range. 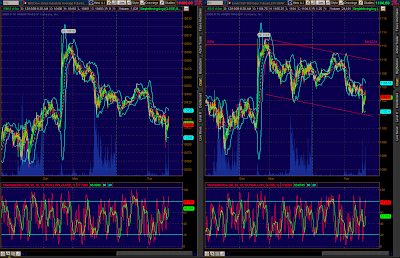 We’re above the 1,107 pivot, but 1,120 is the key here. 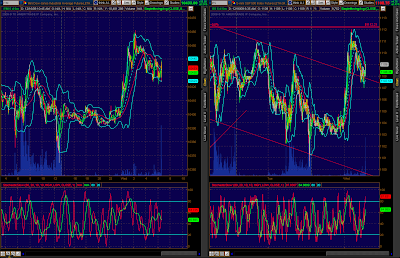 That channel was likely a flag and we broke out, then tested it. 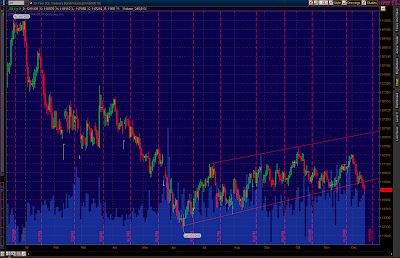 I would expect more attempts at ramming it higher, but expect large volatility following the FOMC. This 50 minute interview with Steve Patterson discusses some concepts of money and our economy, setting the stage for people to understand the plan we are about to present. The next show up will be a conversation with Bill Still, and then we’re going to present the outline of Freedom’s Vision shortly there after. I’d like to thank Steve for spending the best part of his Sunday working on this. He feels strongly about helping our economy and I certainly appreciate his efforts, he’s a great guy. Dylan is rightly pointing out the loopholes in the legislation under discussion, but he fails to point out that those loopholes exist because the legislation was written by the central banks. This is the condition of the United States. Politicians cannot get elected without their money and thus true and JUST reform will not happen until the people make it happen (ht czar Point). Nothing says it better, really, than the data out this morning. PPI showing rising inflation driven primarily by speculation in energy, contrasted against the Empire State Manufacturing index which fell FAR short of expectations, falling from its recent high of 34.57 all the way down to just 2.55. Yet, since that report was compiled oil has fallen from its recent high of $82 all the way back to $70, nearly a 15% fall. But the real action is still in the dollar and in the bond markets where the dollar continues to race upwards and bonds, on the long end of the curve, continue to break down in price, up in yield (higher interest rates). That is a VERY damaging situation for a debt saturated society, it won’t take very much of that action to place tremendous pressure on those who still hold debt, and that would be nearly everyone, especially our own government. But their fast and loose barrowing days may be numbered as the TIC data showed that foreign demand for our debt is waning greatly. Doesn’t sound too bad, right? 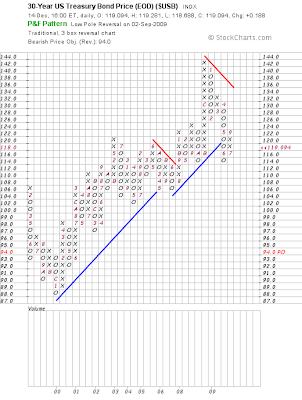 The latest flag formation in the 30 year has already tripped new bearish targets in the Point & Figure diagram, this is showing a target of 94 which would obviously mean that the H&S pattern in the 30 year is in play. All in all, this is exactly what happens when you create a system of money that is backed by debt. Eventually the debt stacks up and the velocity of money crashes as all new money must be used to pay back prior debts, while at the same time the new money adds even more debt – STUPID. I’ve been pointing out this rock and a hard place for quite some time, I even identified the top in the long bond and talked about the parabolic rise and coming collapse in this article - Bond Market Hide & Seek – A Domed House & 3 Peaks... - written almost exactly one year ago. The dollar raced higher this morning against the Euro and against the Yen, reaching the 77 level. 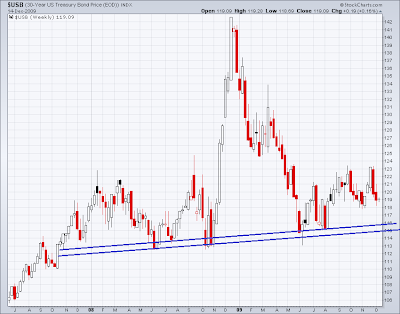 Long bonds are lower, continuing their breakdown for now. Oil is up slightly but is failing, so far, to get back above $70 per barrel, while gold is down pretty sharply. If Texas is even close to the mean, the disconnect between reports like Goldman’s and reality are historic in nature as well. Want to know what results when you pump money into a debt saturated economy, and your money is backed by debt? Okay, here is the PPI report that showed a leap from a yoy -1.9% change in prices to a positive 1.8% change, a yoy jump of 3.7%!! We got the worst of both for this morning's initial economic news. Producer prices surged while Empire manufacturing fell back sharply. Energy costs jacked up the headline PPI for November but the core also rose significantly. The overall PPI jumped 1.8 percent in November after gaining 0.3 percent in October. The boost in the latest month far exceeded the market forecast for a 1.0 percent increase. The November gain was led by a 6.9 percent spike in energy and a 0.5 percent gain for food. At the core level, the PPI rebounded 0.5 percent after a huge 0.6 percent drop in October. The market had projected a 0.2 percent rise for the latest month. It is easy to jump on the worry wagon about inflation from today's report. But there should be a little caution about that. Oil prices have since come down and the jump in the core partly or mostly reflected getting back to near-term trend after October's sharp drop. The core rebound was mainly for light trucks and cigarettes. Month-to-month growth slowed to a crawl in the New York manufacturing region, according to the Empire State index which barely came in above zero for the December reading, at 2.55 vs. far stronger rates of growth in November (23.51) and October (34.57). Nearly everything is slowing this month: new orders 2.20 vs. November's 16.66, shipments 6.30 vs. 12.97, employment -5.26 vs. 1.32, workweek -5.26 vs. 5.26, and unfilled orders, -21.05 vs. -2.63. The month-to-month contractions in unfilled orders and the workweek are bad news for the area's factory workers, especially those that are unemployed right now. Prices paid (inputs) was one thing that didn't slow, at 19.74 vs. 10.53. But the region's manufacturers definitely don't have the pricing power to pass through the higher costs to their customer as prices received (outputs) is showing deepening contraction, at -9.21 vs. -2.63. Even the general six-month outlook fell back, to a still strong 43.01 but down nearly 14 points from last month. Today's report is surprisingly soft but will have to be confirmed by tomorrow's Philadelphia report on the Mid-Atlantic region before questions emerge over manufacturing, a sector that is definitely moving forward though its pace is uncertain. Later this morning the Federal Reserve will post the October U.S. industrial production report, the heart of which are the manufacturing components. So, clearly the strategies of the pump monkeys like Bernanke are failing to produce anything but speculative price increases in localized commodities like oil. The mark to fantasy world of paper has been fluffed, but the real world is still in the toilet. My thesis here is that while the overall PPI turned positive, the moment the stimulus is removed you will immediately return to deflation. 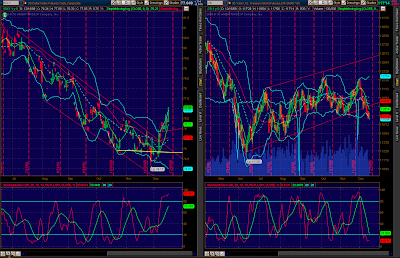 In fact, it may be returning regardless, look at oil. And because of their debt pumping and pushing, each subsequent down cycle will be worse than the last. Of course what Obama does not get is that you can’t push more credit into a credit saturated environment! Oh, you can try, but it won’t work! Incomes are not high enough because we don’t do anything real! Thus, the people cannot afford to keep afloat the overbuilt strip malls, coffee shops, bubble priced auto dealerships, etc. The more they flood the country with debt backed money, the worse this disparity is going to get. Have you ever seen such disparity in two reports like the PPI and Empire Manufacturing reports above? I haven’t. Yesterday Wells Fargo announced that they are doing the same exact steps as BAC and C did to pay off the TARP. This is Timmy Geithner playing tricks on the public and them selling stock to dilute current bag holders while they still can. What they don’t raise in equity sales they are going right back to the Fed and exchanging more garbage for taxpayer subsidized loans and in this way all the executives are snaking out from under those “ominous” bonus restrictions. Dec. 15 (Bloomberg) -- Citigroup Inc. Chief Executive Officer Vikram Pandit, emerging from a U.S. bailout with higher capital levels and loan-loss reserves than any peer, still has a $617 billion reason to worry. That’s the amount of assets left in Citi Holdings, the division that Pandit set up to strip his bank of unprofitable businesses, troubled loans and securities. While the bank has unloaded almost $100 billion of the assets so far, getting stuck with the rest may hinder earnings for years, analysts said. Again, under the rule of law creating shell companies to shuffle assets around is ILLEGAL. Yet our government and regulators do nothing. Capital cannot flourish in this environment, that pile of rubbage is exactly what has “zombified” our banking industry. They need to be cleared out, but they need to be cleared via the rule of law! Anybody else seeing some messages in the above data? I’m thinking that we’ve reached the point where cramming more debt into the system simply isn’t going to do anything productive! The dollar fell on the news, but has since bounced back up to about even, now back above 76.50. My comment in this regard is that the dollar strength seems to be holding, and that is going to make it tough for equities to continue their path higher. Bonds are flat to a little higher, oil is down slightly at $69, gold is up slightly, now $1,120 an ounce. Dec. 14 (Bloomberg) -- Abu Dhabi provided $10 billion to help Dubai World, the state-owned holding company, avoid defaulting on a $4.1 billion bond payment that roiled global financial markets during the past month. Dubai World will use the money to cover debt of real-estate unit Nakheel PJSC that comes due today. The rest of the money will cover Dubai World’s interest and operating costs until the company reaches a standstill agreement with its creditors, Dubai’s government said in an e-mailed statement. After the emirate and its state-controlled companies borrowed $80 billion to diversify away from dwindling oil supplies, Dubai’s ruler, Sheikh Mohammed Bin Rashid Al Maktoum, has been forced to seek Abu Dhabi’s help three times this year as the global financial crisis dried up credit and triggered a property crash in the city state. The Dubai market jumped 10% on this news. So, it may keep the immediate ripple under control for now, but what has really changed? NOTHING. The world is still saturated with debt, we still have governments coming in to bail out moronic ventures, and all this does is transfer the risk from one party to the next. Dec. 14 (Bloomberg) -- Citigroup Inc., recipient of the biggest U.S. bank bailout, struck a deal with regulators to repay $20 billion to taxpayers and escape government-imposed pay restrictions. Citigroup, the only major U.S. lender still dependent on what the government calls “exceptional financial assistance,” will raise the funds with a sale of $20.5 billion of equity and debt. The New York-based company also plans to substitute “substantial common stock” for cash compensation, the bank said in a statement today. Chief Executive Officer Vikram Pandit has pressed for an exit from the Troubled Asset Relief Program out of concern that TARP pay constraints make Citigroup vulnerable to employee poaching by Wall Street rivals. Bank of America Corp. exited the program last week after paying back $45 billion of rescue funds. The bank will sell $17 billion of common stock, with a so- called over-allotment option of $2.55 billion, and $3.5 billion of “tangible equity units.” The U.S. Treasury will sell as much as $5 billion of common stock it holds, with plans to unload the rest of its stake during the next six to 12 months. An additional $1.7 billion of common stock equivalent will be issued next month to employees in lieu of cash they would have otherwise received as pay. The TARP payments will result in a roughly $5.1 billion loss. Citigroup will also terminate its loss-sharing agreement with the government on $301 billion of its riskiest assets. Canceling about $1.8 billion of trust preferred securities linked to the program will result in a $1.3 billion loss, the company said. Citigroup fell to $3.86 in New York trading at 8:03 a.m., down from its $3.95 close on Dec. 11. The stock has tumbled 41 percent this year, valuing the lender at about $90 billion. “It’s GREAT news!” LOL, let me translate. Their massive bonuses and paychecks based on nothing aren’t big enough, so their top employees are having difficulty affording their house in the Hamptons, their yacht, their second and third beach home, their fleet of Ferraris, AND their corporate jet. Soooo, they need the ability to crank out more paper, diluting current shareholders while getting the Treasury off their backs. And what else happened over the weekend? Nothing much, just more looting of the taxpayers. The $447 billion bill spending bill also features provisions to reinstate auto dealers closed down by General Motors and Chrysler. WASHINGTON (CNN) -- The U.S. Senate on Sunday approved $447 billion in spending for several Cabinet departments and other agencies for the 2010 budget year -- money needed to fund the federal government after the coming week. On a mostly partisan vote of 57-35, the Senate approved the compromise omnibus spending plan worked out with the House, which passed it last week. The measure now goes to President Barack Obama to be signed into law to succeed the previous funding resolution that expires December 18. The vote occurred in an unusual Sunday session as the Senate worked for the second consecutive weekend in a push by the Democratic leadership to complete work on a sweeping health care bill and also get the appropriations bill passed. The omnibus bill, which combines six separate appropriations measures, provides money for for non-defense government agencies including the departments of Transportation, State Department, Veterans Affairs, Commerce and Justice for the fiscal year that started October 1. A separate defense spending bill is expected to be considered later this week. The omnibus measure also authorizes about $600 billion in mandatory federal spending on government programs such as Medicare, Medicaid and Social Security, funding that is set by formula and cannot be altered by Congress. Republicans denounced the bill as bloated with wasteful spending. On Saturday, the Democratic-controlled Senate cleared a procedural vote needed to end a Republican filibuster and allow for Sunday's vote to take place. According to the independent, nonpartisan group Taxpayers for Common Sense, the spending bill includes 5,244 earmarks -- or pet projects sought by members of Congress -- that total just under $4 billion. "I demand the president of the United States keep his word, when he signed another pork-laden bill last March, to veto this bill," Republican Sen. John McCain of Arizona, who lost to Obama in last year's presidential election, said before Sunday's vote. Among its many provisions, the bill would allow the government to transfer suspected terrorists now held at Guantanamo Bay, Cuba, to the United States to stand trial, and allow guns in checked luggage on Amtrak trains. It also would provide auto dealers closed down under the General Motors and Chrysler restructuring an opportunity to be reinstated. The bill sets up a binding arbitration process that would let dealers present evidence that could allow them to reopen. SWEET! Failed auto dealers get bailed out with your money, while 5,244 earmarks go sailing off into the sunset, their $4 BILLION now such chump change that it won’t even be mentioned beyond this site by sunup tomorrow. $447 BILLION, a HALF A TRILLION just to keep SOME government entities going through the fiscal year. You know that they say a stalemate is truly the best thing that can happen in politics, there’s proof right there of the type of things that happen when one group is given too much power. No economic announcements are released today, of course this is FOMC week, they will jawbone us once again on Wednesday while keeping interest rates at ZERO. Friday is quadruple witching with options expiration, I’m sure that all the quants will be spinning their computers in overdrive in order to ensure fat Christmas bonuses for them and so as to not ruin the “mood” of the Great Deception just before the holidays. Boy, are their year end numbers going to look good compared to last year! 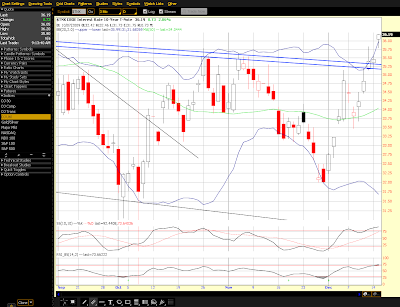 But then we can see that the weekly MACD is rolling over, that the markets are extremely overbought, that historic sized divergences are still in place, that the dollar has broken out higher and that the long bond has broken lower. So much debt, so little time and room to push in more. And so the conundrum continues… can true “recovery” really occur once stimulus funds are truly pulled? And if the economy is really as strong as they say, why are short term rates still at zero? What happens when they no longer are? These are questions that I think we’re going to get answers for pretty soon. Meanwhile the expanding megaphone in the DOW and the bullish looking flag in the S&P continue for now with no movement outside of the range. Since we’re now back at the top of the range, we either start down once again for the bottom of the range, or we break out higher. If we break higher, the flag target is 1,200 on the S&P, an easy 8 to 10% higher from here, a move that would take us from a 50% retrace to a 61.8% retrace. If that move occurs, then it will be an unprecedented rally in terms of comparisons to past credit collapses where we usually see 50% or slightly more on the retrace. For now, however, the ceiling is holding, I’m still sitting on my hands and if we break higher I know that everyone will be jumping in, but I will still be sitting… patiently. I will not put my personal money at risk unless the technical and psychological indicators align with my fundamental understanding. When they are disconnected, I have learned that patience is my friend. I spent a good portion of the day yesterday doing some interviews with Steve of Two Beers fame. Portions of that will be out soon. Right now I’m racing to get a basic outline of Freedom’s Vision out, but I’m not sure it will be in the condition I would like before I leave on Thursday – I’ll be traveling for one week. So, hopefully I’ll get it all out before I leave, if not, it will be right after Christmas which might be best anyway. I can tell that people are starting to tune out already, traffic is down at the site and I expect market volume to stay low.